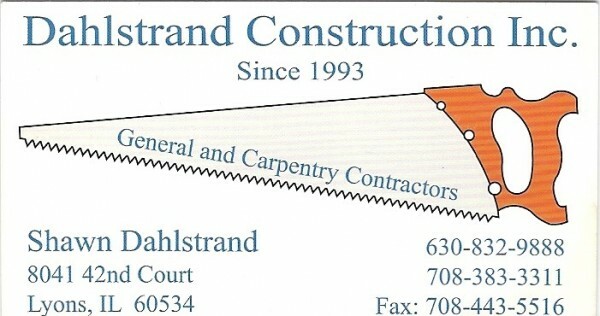 ABOUT US | Dahlstrand Construction, Inc. Located in the close in Chicago suburb of Lyons, our work takes us throughout the Chicagoland area. Over 21 years of experience provides a strong background in varied projects as well as a long list of high recommendations from satisfied customers. Shawn Dahlstrand founded Dahlstrand Construction, Inc. in 1993 after working with other local home building firms. The goal of Dahlstrand Construction is to be a one on one construction firm that works closely with customers to provide a quality product and a result that meets the vision of the client. We specialize in providing custom crafted wood work solutions for problem areas. Only licensed sub-contractors are used and Dahlstrand Construction is also insured, licensed and bonded.